While Rosetta continues to study the ever-changing comet from a distance, the mission teams have been trying to narrow down the location of Philae on the comet nucleus using a variety of data, including imaging, magnetic field, and radio wave measurements. Philae first touched down at the Agilkia landing site on the head of Comet 67P/C-G at 15:34 GMT on 12 November 2014, confirmation arriving back at Earth via Rosetta 28 minutes later. Unfortunately Philae’s harpoons did not deploy and the ice screws alone proved insufficient to secure the lander at Agilkia. As a result, the lander rebounded for an additional two-hour flight before finally coming to rest at a site now known as Abydos. 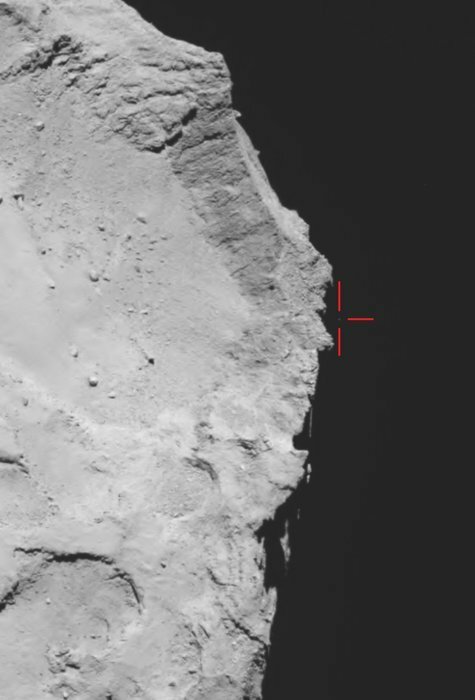 Both Rosetta’s navigation camera and the high-resolution OSIRIS camera successfully identified the first touchdown point, with Philae’s down-looking ROLIS camera providing high-resolution views of the location from as close as 9 metres altitude. The bouncing lander was then identified in OSIRIS and NAVCAM images shortly after it had left Agilkia. Somewhat later, another OSIRIS image was thought to show Philae above the horizon of the large depression known as Hatmehit on the comet’s head. Magnetic field measurements from Philae’s ROMAP provided further details on subsequent events as the lander flew above the comet, including precise timing of the various contact points. Initially, the lander flew in a stable orientation, but is then thought to have struck a surface feature at 16:20 GMT, after which it tumbled. A third touchdown occurred at 17:25 GMT, followed by a much shorter bounce of just a few minutes, before Philae finally arrived at Abydos at 17:32 GMT. Overall, Philae is thought to have travelled more than a kilometre from its initial contact point. Images taken by its ROLIS and CIVA cameras, along with telemetry and data returned by its instruments during its nearly 60 hours of surface operations, have built up a picture of the final landing site. The lander is thought to be in a rough piece of terrain, tilted up against a cliff, and mostly in shadow. In the days and weeks after landing, the OSIRIS team continued the search for Philae by making a detailed examination of new images of the comet as they came in. However, this proved to be a daunting task, given the rough terrain, the small size of the lander, and the distance of Rosetta from the comet. The highest resolution images taken of the region of interest after Philae’s landing were part of a dedicated search that took place in mid-December, at distance of roughly 18 kilometres from the surface of the comet. At this distance, the OSIRIS narrow-angle camera has a resolution of 34 centimetres per pixel. The body of Philae is just 1 metre across, while its three thin legs extend out by up to 1.4 metres from its centre. Rosetta’s OSIRIS wide-angle camera captured this view of Comet 67P/Churyumov–Gerasimenko on 12 November 2014 at 17:18 GMT (onboard spacecraft time), with what is thought to be Philae above the rim of the large depression (marked). 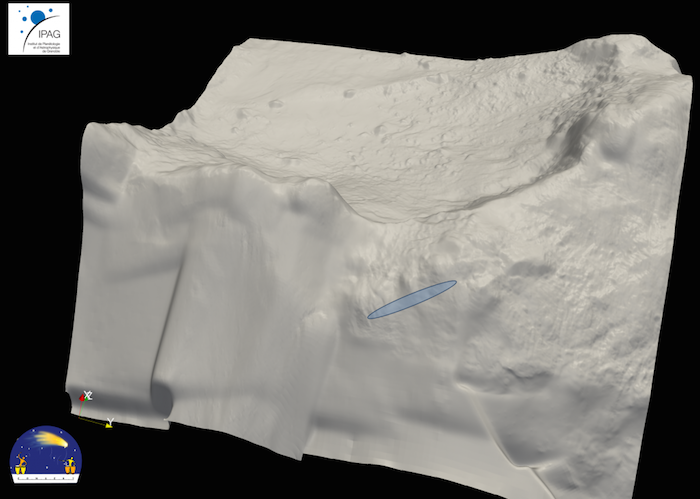 The image has been used to guide subsequent lander search efforts, and provides the basis for trajectory reconstructions. Approximate locations of five lander candidates initially identified in high-resolution OSIRIS Narrow Angle Camera images taken in December 2014, from a distance of about 20 km from the centre of Comet 67P/C-G. 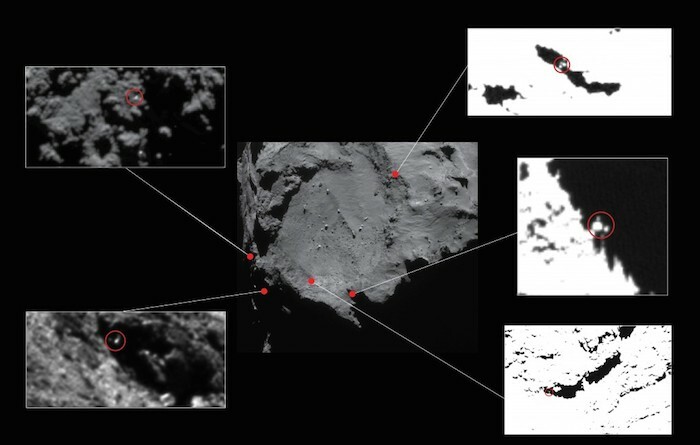 The candidates are circled in the close-ups, identifying Philae-sized features approximately 1–2 m across. The contrast has been stretched in some of the images to better reveal the candidates. 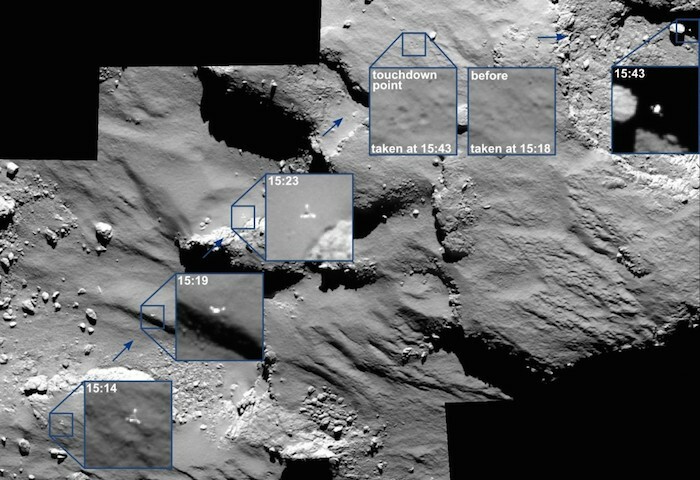 All but one of these candidates (top left) have subsequently been ruled out of consideration due to constraints including the reconstructed lander trajectory and topography at the landing site. The candidate at top left lies near to the current CONSERT ellipse. Editor’s note, 12 June: This image has been updated due to an error in the previous version. The question then is which, if any, of these candidates is the real Philae? Fortunately, more information is available. The initial trajectory taken by Philae as it departed from Agilkia could be worked out from the OSIRIS images. This constrained the problem a bit, but only as far as the second bounce. 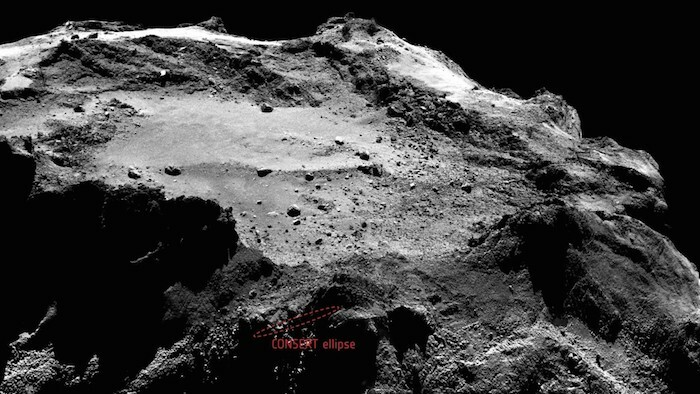 Fortunately, it was possible to narrow down the lander’s final location by using the radio signals sent between Philae and Rosetta as part of the CONSERT experiment after the final touchdown. Combining data on the signal travel time between the two spacecraft with the known trajectory of Rosetta and the current best shape model for the comet, the CONSERT team have been able to establish the location of Philae to within an ellipse roughly 16 x 160 metres in size, just outside the rim of the Hatmehit depression. By combining radio-wave data exchanged between Rosetta and Philae as part of the CONSERT experiment with trajectory data and the current model of the shape of 67P/C-G, the location of Philae has been determined to lie within an ellipse measuring approximately 16 x 160 m. The CONSERT ellipse corresponds to the outer limits of the various solutions identified for the likely landing site of Philae, although this depends to some extent on the shape model assumed. More detailed work, including a full account of all the errors involved, is currently in progress by the CONSERT team. The ellipse represents the team’s current best estimate of the outer bounds of the likely location of Philae based on a number of simulations, but further work is being carried out to quantify things more rigorously in terms of the statistical likelihood of Philae being inside this region. The location of the ellipse also depends on the assumed shape model of the comet: as this is constantly being refined, some slight revisions in the positioning of the ellipse remain possible. Nevertheless, the CONSERT ellipse rules out the majority of the candidates shown in the montage above. But there is at least one candidate near to the ellipse, as well as a number of other bright spots in the vicinity. The current 16 x 160 m CONSERT ellipse overlaid on an OSIRIS narrow-angle camera image of the same region. The location and size of the ellipse is not accurate at the pixel level, and may also change as further CONSERT data analysis proceeds and more detailed comet shape models become available. 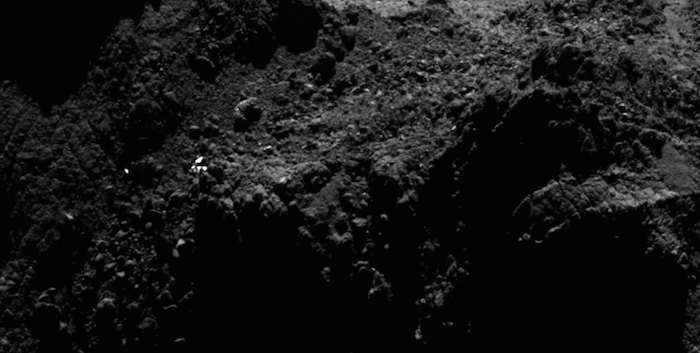 The OSIRIS image is a slightly cropped 2 x 2 mosaic of NAC images taken from a distance of approximately 18 km from the surface of the comet on 13 December 2014. At this distance, the resolution of NAC is approximately 34 cm per pixel, and the full mosaic covers roughly 1.3 km. “We have identified several possible lander candidates in OSIRIS images, both inside the CONSERT region of interest and nearby,” says Holger Sierks, OSIRIS principal investigator at the Max Planck Institute for Solar System Research (MPS) in Germany. Zooming in towards the current CONSERT ellipse, a number of bright dots are seen in the region. As only one (at most) of these could be the lander, the majority must be associated with surface features on the comet nucleus.Credits: ESA/Rosetta/MPS for OSIRIS Team MPS/UPD/LAM/IAA/SSO/INTA/UPM/DASP/IDAFurthermore, and as the image above shows, bright features are common on the surface of the nucleus. The challenge of identifying Philae is made even more difficult by the fact that many of them are transient. For example, small-scale regions of the nucleus may “glint” under favourable illumination conditions, thus appearing in some images but not others. To address this issue, scientists working with OSIRIS team member Philippe Lamy at the Laboratoire d’Astrophysique de Marseille (LAM) and the Institut de Recherche en Astrophysique et Planétologie (IRAP) in France began searching for special sets of OSIRIS images. In particular, they looked for images taken before and after Philae’s landing under nearly similar illumination conditions, to reduce the chances of being fooled by transient surface features glinting. In that way, if something new appeared after landing, it could be Philae. Scanning a broad area encompassing the expecting landing zone, the team identified a promising candidate that is seen on two images taken on 12 and 13 December, a month after the 12 November landing, but not on an image taken earlier, on 22 October. The candidate is also featured in the montage earlier in the post, at top-left. Additional images below show the region containing the candidate as seen on 22 October from a distance of 10 km from the centre of the comet (roughly 8 km from the surface), and then on both 12 and 13 December from 20 km from the centre (18 km from the surface). Before’ and ‘after’ comparison images of a promising candidate located near the CONSERT ellipse as seen in images from the OSIRIS Narrow-Angle Camera. Each box covers roughly 20 x 20 m on Comet 67P/C-G. The left-hand image shows the region as seen on 22 October (before the landing of Philae) from a distance of about 10 km from the centre of Comet 67P/C-G, while the centre and right-hand images shows the same region on 12 and 13 December from 20 km (after landing). The candidate is only seen in the two later images. The illumination conditions are broadly similar in the three images and the same topography can be recognised in each case. The difference in distance at which the images were taken yields a difference in resolution and thus the December images have been resampled and interpolated to match the scale of the October image. As a result, the candidate covers more pixels calculated for a Philae-sized object seen by the OSIRIS narrow-angle camera from a distance of 18 km to the surface. The ‘after’ images have been resampled and interpolated to be on the same scale as the ‘before’ image: this results in the bright spot covering more pixels than in the original data. This graphic shows the solar panels on Philae’s body. Simulations of the day-night cycle and landing site topography show considerable variations in the illumination as local features cast shadows at different times. 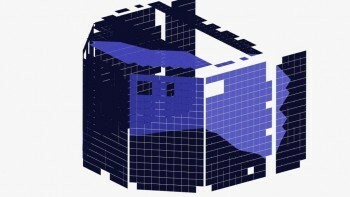 The light blue coloured sections indicate the portion of solar panels thought to be illuminated at the exact moment the 13 December image was taken. While Philae’s legs and feet appear bright in images acquired during its descent to the surface, the simulations suggest that the Sun would not reach the lower portions of the lander at the time the 13 December image was taken. Under these illumination conditions, Philae would only cover a few pixels in the OSIRIS images taken from 20 km. But is this really Philae? Unfortunately, it is impossible to be sure. Ultimately, a definitive identification of this or any other candidate as being Philae will require higher-resolution imaging, in turn meaning closer flybys. This may not be possible in the near-term, as issues encountered in navigating close to the comet mean that the opportunity to make flybys at significantly less than 20 km from the surface may be on hold until later in the mission. But after the comet’s activity has subsided, Rosetta should be able to safely operate in close proximity to the comet nucleus again. The other possibility of further refining Philae’s location would come if the lander were to receive enough power to wake-up from its hibernation and resume its scientific study of 67P/C-G. Then, CONSERT could be used to perform additional ranging measurements and significantly reduce the uncertainties on the lander’s location. At the moment, Philae is still in hibernation, but the mission team remain hopeful that, as the comet moves closer to the Sun along its orbit, the lander will receive enough power in the coming weeks or months to wake up and transmit a signal to Rosetta. "The conditions for Philae's wake-up are becoming more and more favourable as the comet approaches the Sun," says Lander Project Manager Stephan Ulamec. "The team at DLR's Lander Control Center has continued to prepare long term operations for Philae and its instruments in the hope that it does wake up soon." This blog post was prepared in collaboration with CNES, DLR, LAM, and MPS. The candidate discovered by the team of Philippe Lamy at the Laboratoire d’Astrophysique de Marseille (LAM) was identified by G. Faury of AKKA Technologies (a contractor of LAM and IRAP). E. Jurado and R. Garmier of CS-SI (a contractor of CNES) at the Philae Science Operations and Navigation Center at CNES (SONC), A. Herique and Y. Rogez of the CONSERT team at Institut de Planétologie et d'Astrophysique de Grenoble, and P. Heinisch of the ROMAP team at IGEP, the Technical University of Braunschweig, were also involved. CONSERT: CONSERT is the Comet Nucleus Sounding Experiment by Radiowave Transmission. The principal investigator is Wlodek Kofman of the Institut de Planétologie et d'Astrophysique de Grenoble (IPAG), France. The CONSERT instrument was designed built and operated by IPAG, LATMOS (Laboratoire Atmosphères, Milieux, Observations Spatiales, France) and MPS (Max Planck Institute for Solar System Research, Germany) and was financially supported by CNES, CNRS, UJF, DLR, and MPS. OSIRIS: The scientific imaging system OSIRIS was built by a consortium led by the Max Planck Institute for Solar System Research (Germany) in collaboration with CISAS, University of Padova (Italy), the Laboratoire d'Astrophysique de Marseille (France), the Instituto de Astrofísica de Andalucia, CSIC (Spain), the Scientific Support Office of the European Space Agency (The Netherlands), the Instituto Nacional de Técnica Aeroespacial (Spain), the Universidad Politéchnica de Madrid (Spain), the Department of Physics and Astronomy of Uppsala University (Sweden), and the Institute of Computer and Network Engineering of the TU Braunschweig (Germany). OSIRIS was financially supported by the national funding agencies of Germany (DLR), France (CNES), Italy (ASI), Spain (MEC), and Sweden (SNSB), and the ESA Technical Directorate. ROLIS (ROsetta Lander Imaging System) is a descent and close-up camera on the Philae Lander. It has been developed by the DLR Institute of Planetary Research, Berlin. ROMAP: ROMAP is the Rosetta Lander Magnetometer and Plasma Monitor. The contributing institutions to ROMAP are: Institut für Geophysik und Extraterrestrische Physik, Technische Universität Braunschweig, Germany; Max-Planck Institut für Sonnensystemforschung, Göttingen, Germany; Hungarian Academy of Sciences Centre for Energy Research, Hungary; and Space Research Institute Graz, Austria. The co-principal investigators are Hans-Ulrich Auster (Technische Universität, Braunschweig) and István Apáthy, KFKI, Budapest, Hungary. Rosetta is an ESA mission with contributions from its Member States and NASA. 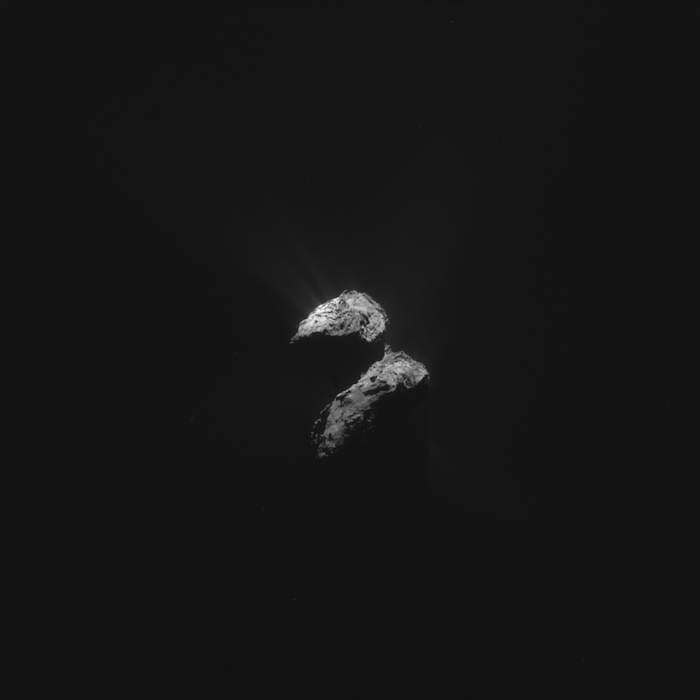 Rosetta’s Philae lander was provided by a consortium led by DLR, MPS, CNES, and ASI. Astronomers using ESO’s ground-based Very Large Telescope (VLT) in Chile are watching the development of Comet 67P/Churyumov-Gerasimenko’s coma and tail from Earth. This image is based on data acquired on 22 May and is about 300 000 km wide at the distance of the comet. 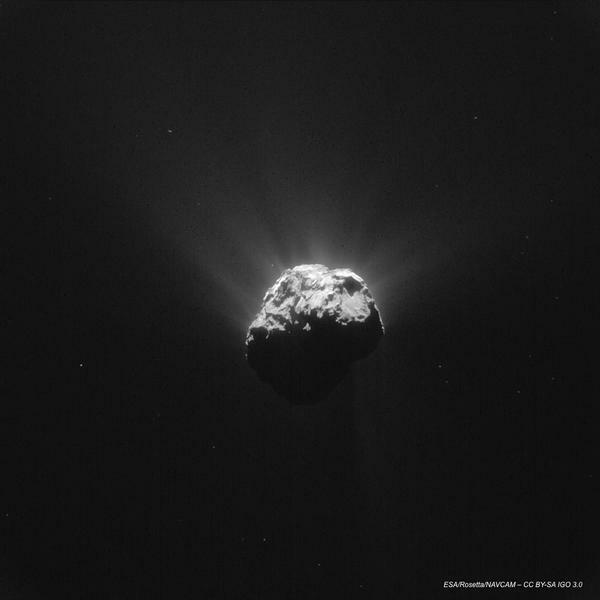 The comet’s dusty coma and tail is swept away from the Sun, which is towards the left of the image in this orientation. The tail can be seen to stretch at least 120 000 km in this relatively shallow image, and in deeper images, the coma alone is estimated to be at least 80–100 000 km across. 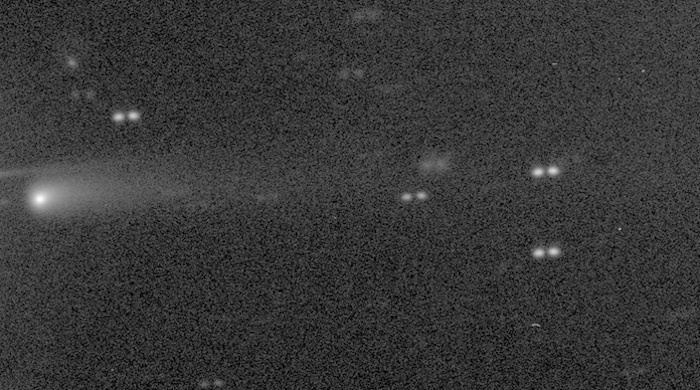 As each pixel in this image spans roughly 400 km at the comet, both Rosetta and the nucleus of 67P/C-G are too small to be resolved. 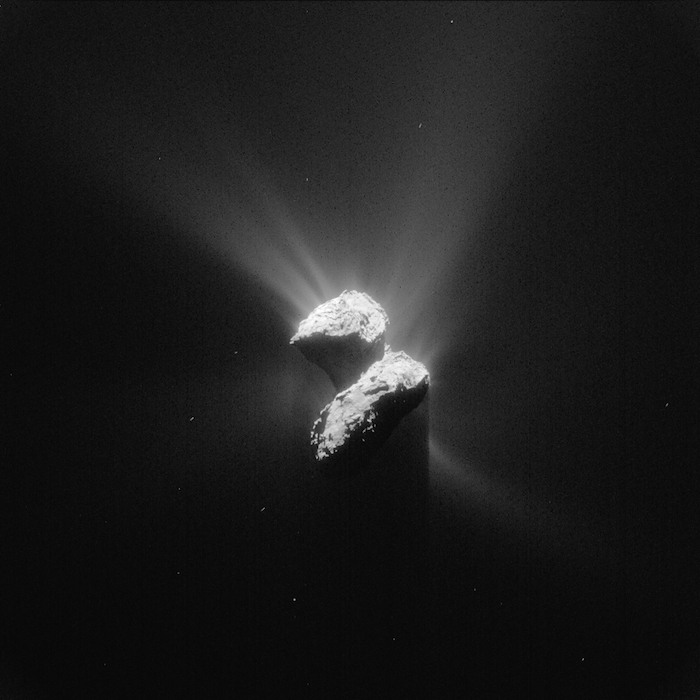 But images like these provide important context information for the images taken by the spacecraft close to the comet, as its activity increases towards perihelion. At the time the image was taken Rosetta and the comet were about 238 million km from the Sun; at perihelion on 13 August they will be between the orbits of Earth and Mars at a distance of about 186 million km from the Sun. This image will be shown as part of the BBC Sky at Night TV programme in the UK on Sunday 14 June. The episode is a Rosetta special and includes interviews with a number of scientists discussing what we have learned about Comet 67P/C-G so far. Rosetta's lander Philae is out of hibernation! The signals were received at ESA's European Space Operations Centre in Darmstadt at 22:28 CEST on 13 June. More than 300 data packets have been analysed by the teams at the Lander Control Center at the German Aerospace Center (DLR). "Philae is doing very well: It has an operating temperature of -35ºC and has 24 Watts available," explains DLR Philae Project Manager Dr. Stephan Ulamec. "The lander is ready for operations." 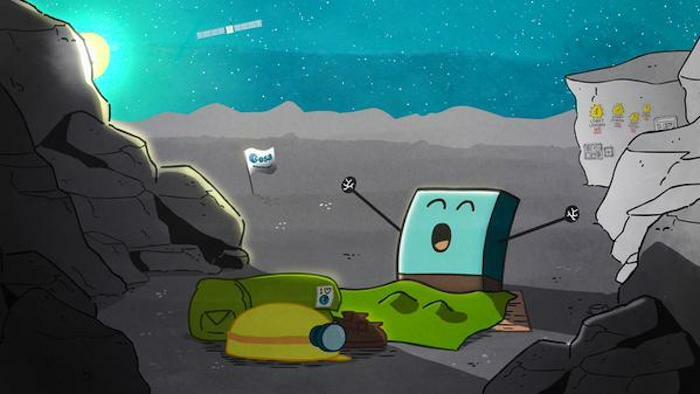 For 85 seconds Philae "spoke" with its team on ground, via Rosetta, in the first contact since going into hibernation in November. When analysing the status data it became clear that Philae also must have been awake earlier: "We have also received historical data - so far, however, the lander had not been able to contact us earlier." 22:28 CEST on board Rosetta: The orbiter's Electrical Support System Processor Unit (ESS) starts receiving radio signals from Philae, approximately 200km beneath Rosetta on the surface of Comet 67P/Churyumov-Gerasimenko. 22:28 CEST on board Rosetta: Spacecraft immediately starts relaying Philae data to Earth via NASA's 70m deep-space antenna at Goldstone, California. One-way light time is 16.8 minutes, so signals start arriving at about 22:45 CEST on Earth and are immediately relayed to ESOC, Darmstadt, Germany. Just after 22:45 CEST in Planetary Missions Dedicated Control Room, ESOC: The on-duty spacecraft controller watching telemetry downloading from Rosetta notices some alarms that had been specially set on some Lander ESS parameters. These had been implemented shortly after separation (in November 2014) to ensure any Lander contact would not be missed. After confirming this was, indeed, correct, and that lander telemetry were being received, he consults an 'Action Sheet' kept on hand since 15 November 2014 (when Philae entered hibernation on the comet) to determine what to do. 23:00 CEST ESOC: As defined on the 'Action Sheet', the on-duty spacecraft controller telephones the Rosetta on-call spacecraft operations engineer, Jake Urbanek, at his home near Darmstadt. He reports the news. 23:30 CEST at Jake's home: Jake calls Rosetta Spacecraft Operations Engineer Armelle Hubault at her home to confirm that the Lander had switched on and transmitted telemetry. 23:45 CEST at Armelle's home: Armelle confirms the news by calling the Lander Team on a pre-agreed phone number. Lander team confirms Lander is back! Armelle also rings Sylvain Lodiot, the Rosetta Spacecraft Operations Manager, who then rings Paolo Ferri, ESA's Head of Mission Operations. Paolo subsequently relays the information to the rest of the Rosetta science and operations managers. Armelle reports: "I had just brushed my teeth and was heading to bed when the phone rang. Seeing Jake was calling, I picked up the phone and said: 'This has to be bad news. We've got a safe mode, don't we?' "
"He replied: 'Well, maybe not. Maybe it's good news!' And, yes, it was." 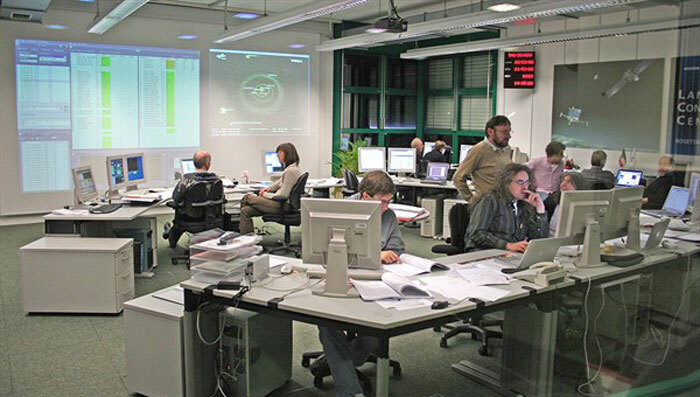 Editor's note: After this weekend's news, the Rosetta Flight Control Team today have switched into high gear, with a great deal of coordination work now being carried out with the flight dynamics experts at ESOC as well as with the Rosetta Science Ground Segment (RSGS/ESAC), the Philae Lander Control Centre team (DLR Cologne) and the lander science operations centre (SONC), at CNES/Toulouse. Lander Philae hat sich am 14. Juni 2015 erneut gemeldet: Von 23.22 Uhr an sendete er bis 23.26 Uhr einige Datenpakete, die nun im Deutschen Zentrum für Luft- und Raumfahrt (DLR) ausgewertet werden. "Allerdings war dieses Mal die Verbindung zu ihm relativ instabil", sagt Philae-Projektleiter Dr. Stephan Ulamec vom DLR. Am 13. Juni 2015 hatte der Lander sich zum ersten Mal nach seinem fast siebenmonatigen Winterschlaf für 85 Sekunden zurückgemeldet und erste Daten zu seinem Zustand gesendet. Auch nach dem zweiten Kontakt bestätigten die aktuellen Daten, dass Philae auf dem Kometen Churyumov-Gerasimenko in einem guten Zustand steht und betriebsbereit ist. Nun sollen die Bahnen des Orbiter Rosetta angepasst werden, damit längere Kontaktzeiten zu Philae möglich sind. Ausreichend Energie und eine nicht ganz so eisige Betriebstemperatur bringt Philae zurzeit bereits mit - immerhin drei Stunden Sonnenlicht pro Kometentag erreichen ihn und versorgen den Lander mit Energie. Bisher hatte man nur mit 1,3 Stunden Beleuchtung gerechnet. Bevor das Team im Lander-Kontrollzentrum des DLR Philae in rund 304 Millionen Kilometern Entfernung von der Erde kommandieren kann, müssen stabile und längere Verbindungen zum Lander ermöglicht werden. Nur dann können die vorbereiteten Kommandos für die wissenschaftliche Arbeit mit seinen zehn Instrumenten an Bord hochgeladen werden und die nächsten Experimente beginnen. In welcher Reihenfolge die Instrumente zum Zuge kommen, wird festgelegt, sobald Philaes Gesundheitszustand genau feststeht. "Zunächst werden sicherlich die nicht-mechanischen Instrumente zum Einsatz kommen, also Instrumente, die nicht bohren oder hämmern", erläutert DLR-Wissenschaftler Stephan Ulamec. Ganz vorne mit dabei sind voraussichtlich auch Instrumente, die nur wenig Energie verbrauchen und auch nur geringe Datenmengen zur Erde schicken müssen. Mit dem Aufwachen von Philae könnte es zum ersten Mal möglich sein, auf einem Kometen vor Ort zu forschen, während dieser auf dem Weg zur Sonne immer aktiver wird. 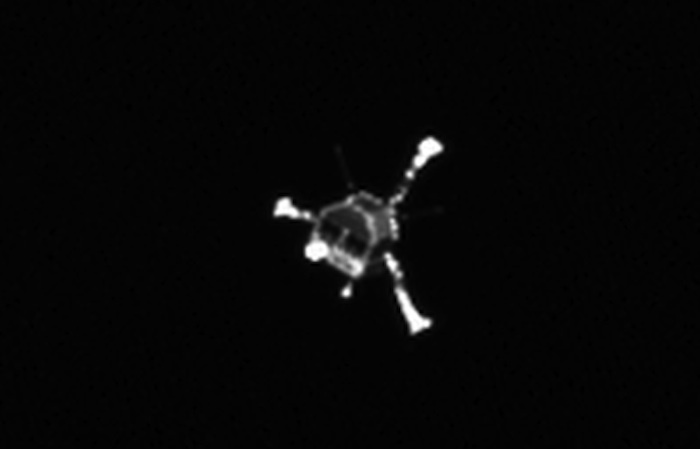 Lander Philae hat sich am 13. Juni 2015 um 22.28 Uhr wieder aus seinem Winterschlaf zurückgemeldet und die ersten Daten zur Erde gesandt. Über 300 Datenpakete hat das Team des Lander-Kontrollzentrums des Deutschen Zentrums für Luft- und Raumfahrt (DLR) ausgewertet: "Philae geht es sehr gut: Er hat eine Betriebstemperatur von minus 35 Grad Celsius und verfügt über 24 Watt", erläutert DLR-Philae-Projektleiter Dr. Stephan Ulamec. "Der Lander ist somit betriebsbereit." 85 Sekunden lang "sprach" Philae mit seinem Bodenteam bei seinem ersten Kontakt seit seinem Winterschlaf. Bei der Analyse seiner Statusdaten zeigte sich, dass Philae auch zuvor schon wach gewesen sein muss: "Wir haben auch historische Daten erhalten - bisher war dem Lander allerdings noch nicht gelungen, mit uns Kontakt aufzunehmen." Nun warten die Wissenschaftler auf den nächsten Kontakt. In Philaes Speichermedien stecken noch weitere 8000 Datenpakete, die dem DLR-Team Aufschluss darüber geben werden, wie es Philae in den vergangenen Tagen auf Komet Churyumov-Gerasimenko ergangen ist. Philae hatte sich am 15. November 2014 um 1.15 Uhr abgeschaltet, nach dem er etwa 60 Stunden auf dem Kometen in Betrieb war. Seit dem 12. März 2015 war immer wieder die Kommunikationseinheit auf dem Orbiter Rosetta eingeschaltet, um den Lander zu rufen und seine Antwort zu empfangen. Since March 2015, when Philae’s environmental conditions started to improve with higher surface temperatures and better illumination, the orbiter’s receiver had been turned on periodically to listen for signals from the lander when the orbital geometry was thought to be optimum. “We are still examining the housekeeping information at the Lander Control Centre in the DLR German Aerospace Center’s establishment in Cologne, but we can already tell that all lander subsystems are working nominally, with no apparent degradation after more than half a year hiding out on the comet’s frozen surface,” says DLR's Stephan Ulamec, Philae Lander Project Manager. A second, smaller burst of lander data was received on Sunday, 14 June, at about 21:26 GMT, lasting just a few seconds. These data were confirmed to give the current status, showing the lander’s internal temperature had already risen to –5ºC. Philae’s memory has stored over 8000 packets of additional status data, but it is unclear from when in recent days they were recorded. Engineers at the Lander Control Centre have determined that Philae is already being exposed to sufficient sunlight to heat it to an acceptable operating temperature and to generate electricity. The telemetry downloaded covered the lander’s status for a full night–day cycle of the comet, which is helping ground teams to understand how the Sun is shining on the lander. The solar panels appear to be receiving power for over 135 minutes in each illumination period. “While the information we have is very preliminary, it appears that the lander is in as good a condition as we could have hoped,” says Dr Ulamec. The main task now for all the mission partners – ESA for Rosetta operations and DLR and France’s CNES space agency for lander operations and science, respectively – is to determine how to optimise Rosetta's orbit so as to facilitate contact and enable new science investigations. It is believed that there is sufficient power now being generated to allow some science measurements during the time Philae is illuminated, with initial activities focusing on low-power measurements. This first phase would also likely include measurements that did not previously generate science in November. However, the mission teams first must establish a more robust link between Rosetta and Philae before uploading the first batch of science operations commands. The quality of the communication link is also possibly related to the trajectory Rosetta is flying and the orientation it adopts. Currently, Rosetta experiences two possible communication slots per 24 hours – once per 12-hour comet rotation. Until 23:35 GMT on Tuesday, 16 June, Rosetta will be flying an orbit set by already-uploaded commands on the terminator – the plane between comet day and night – moving out from about 200 km to 235 km altitude. This orbit is not optimised for lander communication, so longer periods of contact may not be possible until the trajectory has been changed. “With work done by the flight dynamics and operations team at ESOC and based on intense planning being conducted with the mission partners today, a new orbit will be devised that ensures optimum lander communications beginning with the next command upload later tonight,” says Paolo Ferri, ESA’s Head of Mission Operations. This new orbit will include an already-planned reduction of distance from the nucleus, down to 180 km versus 200 km, and ‘nadir pointing’ – continuously pointing Rosetta’s communications unit at the comet. In the coming days, the orbiter may also be moved closer to the comet, without compromising the safety of the spacecraft, to help communications. 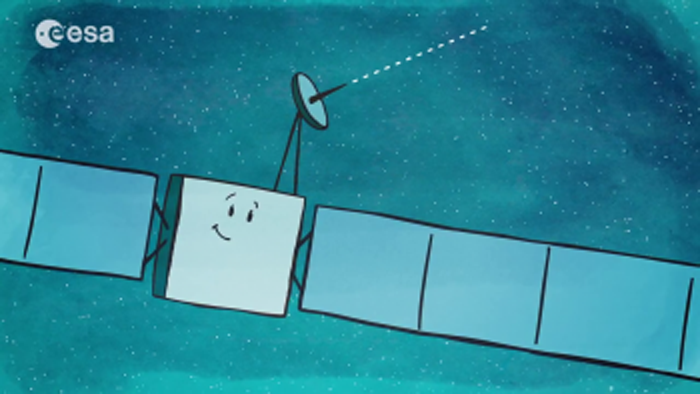 The new orbit will be flown by Rosetta starting after 23:25 GMT on 16 June until 19 June, aiming to enable more and longer contacts with Philae, especially towards the end of this period. Establishing a regular and predictable pattern of contacts is a prerequisite for performing a complete assessment of the lander’s status and for planning science operations. “If we manage to achieve and maintain a predictable contact pattern,” continues Paolo Ferri, “the lander teams can devise a strategy for a new sequence of scientific operations. As a bonus, any operation of Philae’s instruments up to or through perihelion on 13 August – the comet’s closest point to the Sun along its orbit – will allow in-situ study of a comet during its peak activity. 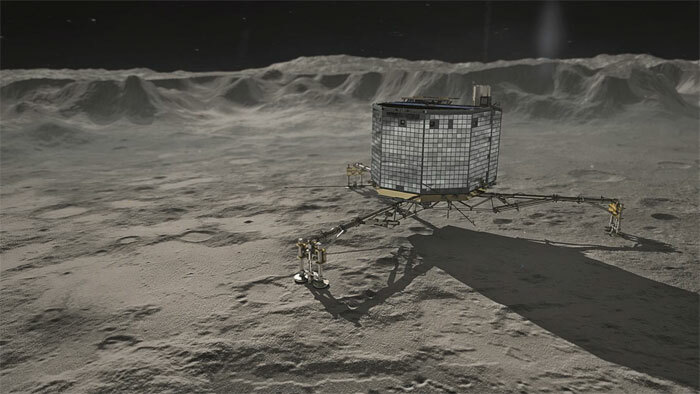 Had Philae landed at the planned site, at Agilkia in November 2014, its mission would likely have ended in March because of the higher temperatures of that location as solar illumination increased.